Hi everyone. Today's card is a reminder for the CAS Watercolour October Challenge - Fall Leaves. And also a reminder that we are celebrating our 1st Birthday this month at CWCC! Come join us ... there is a prize for the winning card ... and also one prize for a random pick among all entries. When I think of fall leaves, I automatically visualize shades of yellow, orange and reds. Not today. Today's card is all about the fern. I recently bought this beautiful background fern stamp. I don't own a lot of background stamps because with my CAS style I thought I wouldn't get a lot of use out of them. Wrong! I cut it down to create a small, but colourful panel of watercoloured ferns. I used my Stampin' Write markers to colour the rubber stamp, spritzed with water and stamped onto mixed media paper, pressing down firmly. Once the stamp was removed, I used a paper towel to mop up any excess water/ink, which left a beautiful, soft image for the background. Love it! I simply added a black die-cut silhouette fern leaf. I added a very thin frame of black and a black stamped sentiment to tie it all together. Check out the challenge blog to see the amazing reminder cards made by our design team and wonderful Guest Designer, Marcia. So pretty, Loll. Love the muted colours of your background. The perfect backdrop to your bold black fern die cut. that is a great background stamp and you've used it beautifully, Loll! Love that soft and pretty spritzed background, Loll! 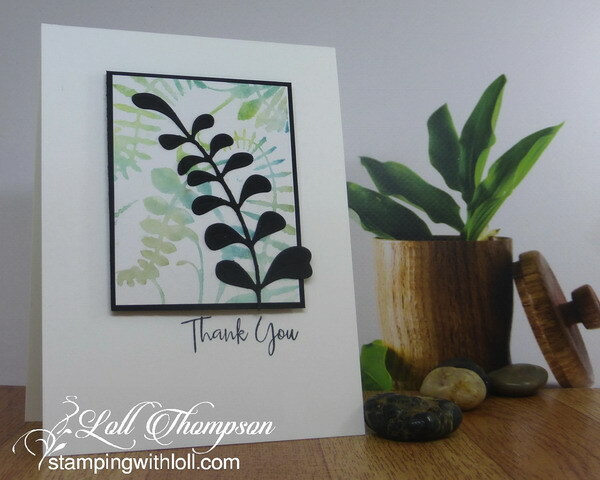 Love your soft background of ferns, Loll with your black silhouette fern leaf. I love how the soft pastels shadow your beautiful die cut. I'm also amazed at how clean your cuts are on your silhouette. This is so crisp and fresh, Loll! Beautiful design! The black silhouette is such a beautiful element. It's a beautiful card. The background works beautifully with the die cut. So pretty in the soft colours - love the match of the background stamp with the die cut. You should post it in SCS F4A challenge from last Friday - a Fall card that is not in the traditional orange, red, etc. colours. Yes, this is a gorgeous card, so glad you bought the fern stamp because as always you come up with a masterpiece of clean and simple! I missed that stamp during their sale, your eye for layout and colour are amazing Loll. I just love the soft colours and the pop of black. Oh golly, Loll, that fern background looks beautiful. I adore the colors you chose and how you stamped the image. The silhouette fern pulls everything together so perfectly with the pop of black. Fabulous! :) Hugs! terrific background Loll and an awesome card. Really pretty card, love these ferns! Love your interpretation of fall leaves, Loll. The soft green stamped fern background is so pretty. Beautiful card. Wow! What beautiful, graceful ferns, my friend! I love the soft look with the black die cut fern for contrast! this is such a beautiful card mf...love, love the colours you used..
Love the soft background and how the black frame accents the die cut fern, Loll. Such a gorgeous background you made Loll. I love your choice of adding one dark fern. So beautifully coordinated background with cut out element. Great selection of shapes and colors. I love the delicacy of this card. Your background is so pretty, Loll! 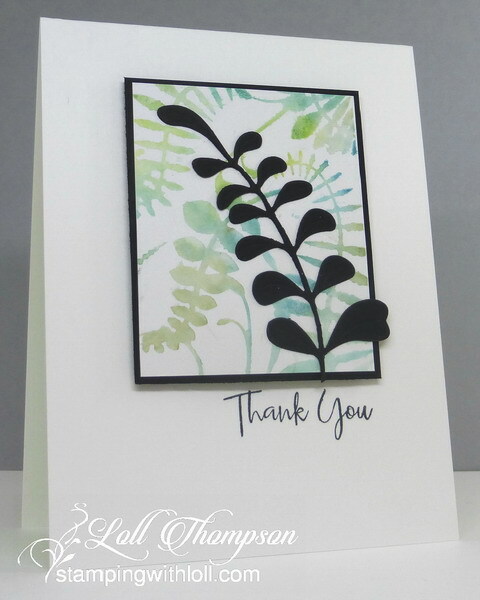 I think the fern is a great choice because of the airy feel to this leaf, and I love how you added the black die cut to your design! 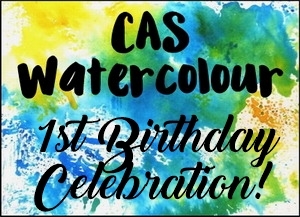 Another beautiful card to celebrate your first birthday at 'CAS Watercolor'! Congrats again!!! What a wonderful surprise to find this very cas-imply beautiful card in my mailbox recently. Love the soft coloured background for that stand out leaf. Love it. Thank you so much Loll.